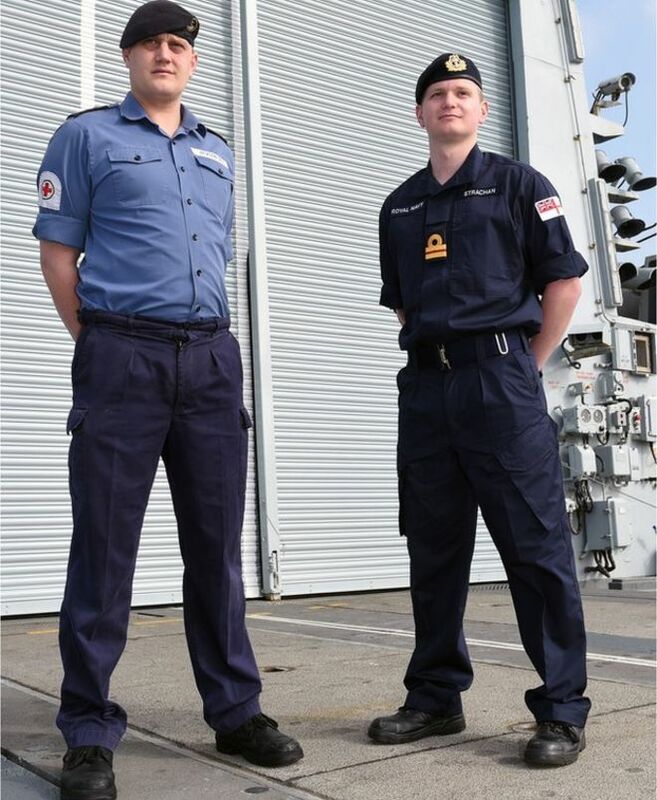 The Royal Navy has unveiled a new version of the Action Working Uniform, seen at right. It is the first change to this uniform in 70 years. Ever-changing uniform requirements can be frustrating. Just when you get your sea bag set, the U.S. Navy unveils a new or updated uniform to add to the list. In fact, there are more than a dozen changes in the works right now — an improved fire-retardant coverall, moisture-wicking warm-up suits, service dress blue jumpers, lightweight pairs of the Navy working uniform, a cold-weather parka, just to name a few. The U.S. Navy isn’t the only one doing this. 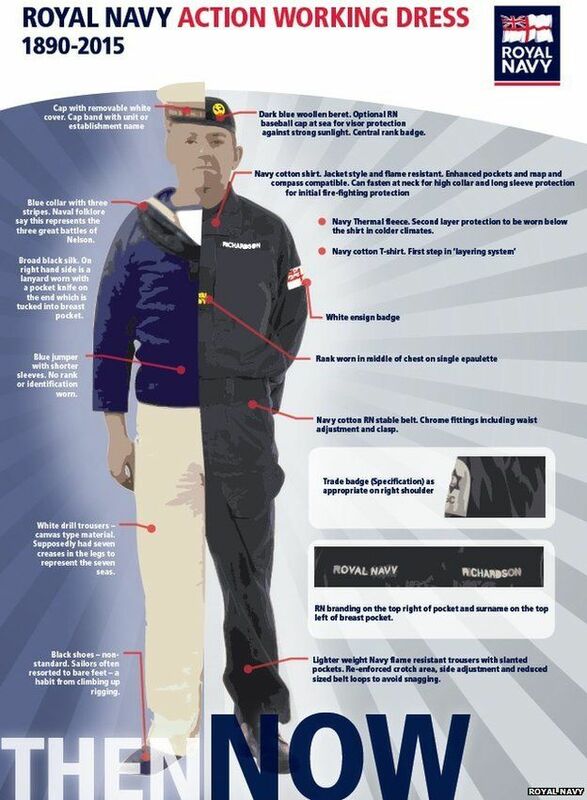 The Royal Navy has unveiled its new working uniform, which will replace the duds they’ve worn since World War II. Now that’s old school! Step 2: They made it practical. They used a modern, lightweight material that is more flame-resistant (unlike the costly error previously made on this side of the Atlantic). The uniform is better tailored for comfort, and policy allows for different undergarments to accommodate weather changes. Designers also threw in some cool-looking slanted pockets to make it easier to use. The new version of the action working dress is more flame-resistant and includes features like slanted pockets that boost wearability. Step 3: They made it noticeable, but not shockingly so. The Brits didn’t take the massive leap the U.S. Navy took in adopting its current working uniform. Instead, the light blue shirt and dark trousers that have been worn the past 70 years were changed to a darker blue. Rank is worn at the front rather than the shoulders; the service’s White Ensign is fixed to the left shoulder and stands out nicely. Step 4: They put it to the test and adjusted fire. A wear test was conducted on several ships and subs throughout much of 2014. Recommendations drove a few minor changes. Step 5: Fire for effect! The crew of HMS Lancaster donned the conservative, yet eye-catching new uniform in March as they set sail on a nine-month deployment to the South Atlantic. The first 22,000 sets are now being issued to operational and sea-going ships, officials said in a chat with BBC. Perhaps the U.S. Navy can now follow the example of the folks across the pond as they develop the an improved version of the flame-resistant variant coveralls. Officials have suggested the forthcoming uniform could replace NWUs in the near future. Here’s to hoping the final version is good enough to carry the next 70 years.